Treon's Realm: "I Survived The End Of The World And All I Got Was This Stunning Zelda Sountrack!" "I Survived The End Of The World And All I Got Was This Stunning Zelda Sountrack!" 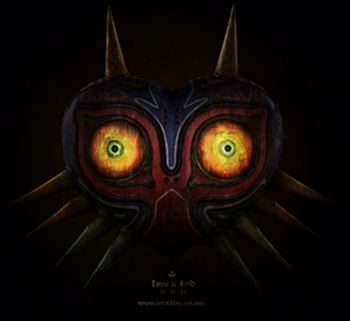 Now that we have all survived the end of the world, I feel a fitting way to celebrate is with an excellent fan made album for The Legend of Zelda: Majora's Mask titled Time's End. As is the case with many passionate fan works, this album perfectly captures the spirit of its source material while bringing a level of quality and polish normally reserved for cinematic soundtracks. All of the tracks perfectly capture the somber haunting mood of one of the most criminally underrated Zelda titles in the entire series. My personal favorite so far is the Clocktown theme which clocks in at over 6 minutes and features themes from throughout the legendary series even managing to work in ambient sound effects that transport you to the doomed town. The album is available for download with the option of naming your own price starting at a mere 50 cents! Enjoy and please share!